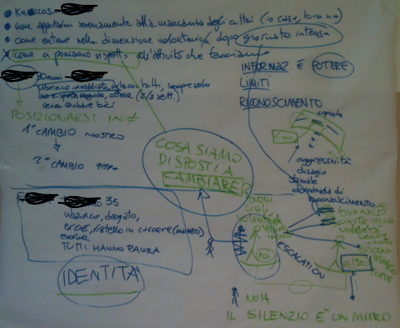 Since a couple of years, I am collaborating with the association Noi sulla strada (we on the streets) in Padova. Sometime it happens to find groups where a certain climate & atmosphere of deep & profound share happens since the first time. The group-work sessions are periodical & in the shape of intensive daily seminars: a fresh & composite group of volunteers & professionals, young to old, dedicates one entire day every three months to deepen the issues related to the relation care & the interventions with individuals in situations of marginality that they met during street work, in shelthers, as well as within their Kuklos project. Our sessions last from 9.30 am to 5.30 pm & are open to the contributions & the issues brought in by participants in the opening part of each session. As in other circumstances, the group agreed to share their findings, outputs & results. The emotional quality of the relation is never static, but it moves around a reciprocity matrix. This matrix is inherent: the reciprocity is an intrinsic quality of the relation, the element of uniqueness into which all the meanings & significations merge. Under this light, it is possible to develop a "condensate" of consciousness made of: the awareness of our identitarian perception (who we are); the awareness of our emotional condition (how we feel); the awareness of our prejudices & stereotypes (how we represented what we expected to find); the awareness of the dynamics of a given relational circumstance (what we receive, perceive & return back in the relation). These awareness might lead to an "inner knowledge", which itself suggests the importance of being coscious enough on the "what-to-do" part. It marks the imporance of consciousness within one's limits & the respect of the others. A role-play game showed the evidence of how a given relational dynamic (in our case, an aggression) was deeply connected with a projective movement of existential hardship. When such an emotional state persists, it tends to crystallize & turn into an absolute by which a person defends himself by moving the emotional quality of their "partridge evil". It is almost a demand of external recognition of being someone different from the internal rage & turbulence: if I push my aggression on some else, than I might pretend I am not angry, or still sign my anger as a response to the counter-aggression arising from the other. To move on from a relational block (meaning those situations which tend to reproduce themselves in a very similar way, if not identical), the group faces one of those basic issues of the relation of care: the power game & the narcisism, identifying this illusion to control the relation & to be necessary for the change of the other. The role-play allows to see clearly how the care-work is not over-defining (I have no power to define the care-process of the other): it is a process where the true & only subject of the care is the subject of care itself. This is evident on a daily experience. As many might have witnessed during their life, their only available change is the one each single individual feels it is possible at first place (I could), & it is achievable (I would) in second place. Looking deeper in the relation of care implies a basic & ineluctable question: if & how, one care-giver is disposable to meet its own change. The emotional quality is always unpredictably, unavoidably & implicitly precious: every emotion is basically just "an" emotion. Far before being rationally perceived as a value (usually in a ratio between good/bad, old heritage of the god/evil issue), an emotion is the way to express to ourselves, as well as to others, something of our inner nature. Rage, boredom, happyness, satisfaction, serenity, they are all qualities of our inner speech, revealed to ourselves & to others. Ignoring an emotion, its denial & mute, they are all acts which enlights something of the subject & of its defenses: the silence might be a wall when one doesn't listen. The care-giving relation has a double-nature: it might display its "do-part", & also its "do-not-part". 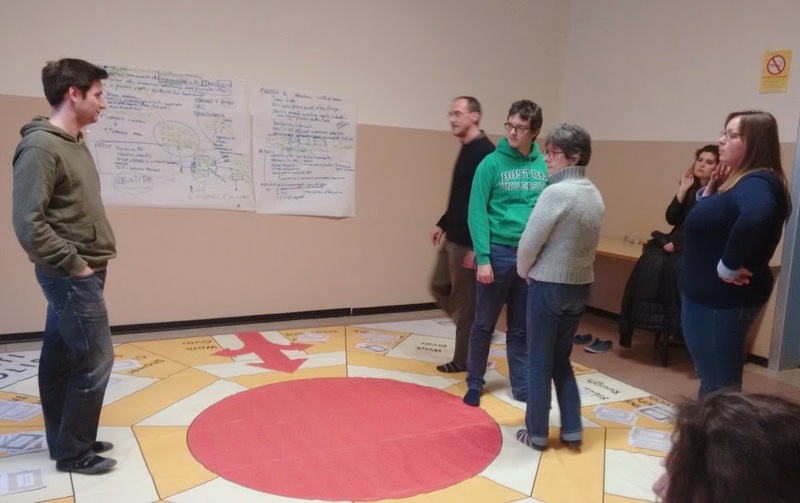 When the care-offer is conscious, the group dynamics are explicited, the challenge to move our perspectives is open, the perception of people limits & of the hidden danger are clear, the "do-part" display all its opportunities. At opposite, when isolation & self-isolation take place, when the denial of evidence is persistent, when the group & the gare-giver run useless risk, or play the hidden game of self-affirmation, the "do-not part" might close the speech of development any internal & relational awareness. 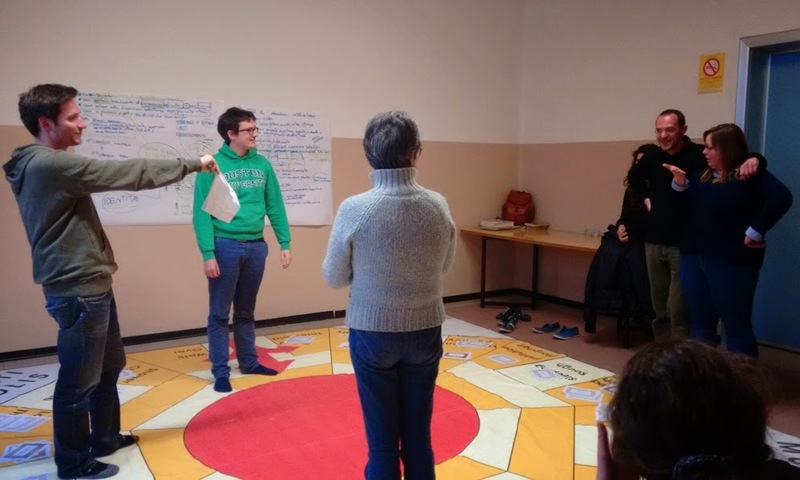 During this session in Padova, we used the MultiPolis tool together with a new modality. It was involountary inspired by Alice, a young psychologist from Padova. Some times ago I were in Vicenza for another training session, & during a coffee break I noticed a questionnaire addressed to shelther's users on a desk; it was one of the instrument she used for her final essay to research a collective dimension moving from single interviews. I read it, & a spark of brigthness came through: why not responding to those question in a collective way? 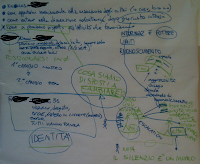 The process that came trough this idea is easy: in the beginning, the group defines a case study. Then the group collects all its relating questions. 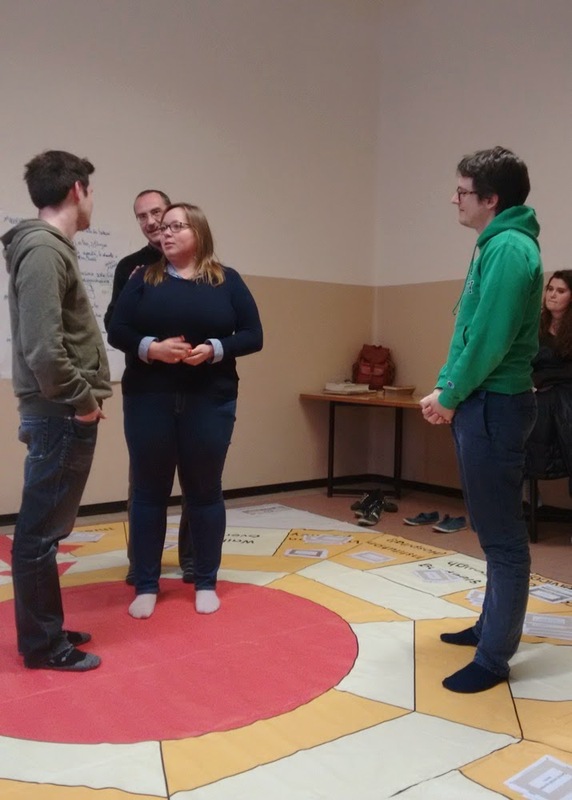 In the role-play, all participants sit in a circle, with closed-eyes & hand-taking, so to create a physical circularity while focusing on their inside. The clasped-hands create a physical connection & circularity; the closed-eyes prepare to look inside, favouring an inner-vision. The conductor moves silently around the participants, asking to each & everyone the before-defined questions: this allows to investigate the different components of the case-study as collectively shared & perceived. Different bodies that perceive & give speech to an identity. 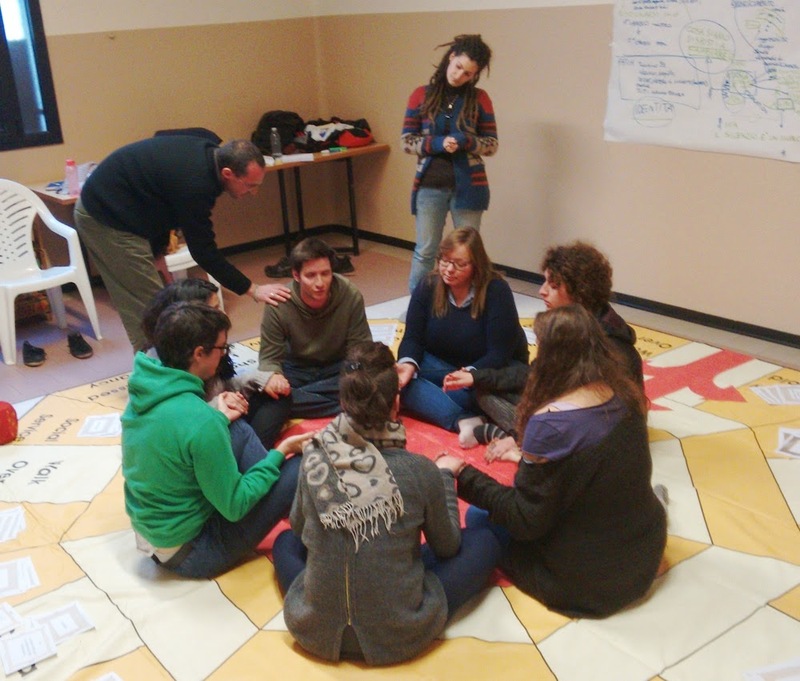 The intensity & the emotional quality of such share is usually very high, so the group must be prepared to it; when it is the right moment in time, it is one of these group-work moments which I felt as particularly significant, enriching, & important. I want to thank my collegue Alice for her involuntary initial inspiration, & to have shared the conduction with me during this session in Padova. I wish her "all the best" for her new project & adventure in south America. Last but not least, I want to thank all the participants for their share, trust & disposability, & Anastasia for her intense pictures.